Could Iowa Senator Joni Ernst be a Possible Running Mate for Donald Trump? Could Iowa Republican Senator Joni Ernst be on Donald Trump’s short list of possibly VP candidates? According to the NY Times, Trump met with Ernst in Monday in New Jersey. Other candidates include Indiana Gov. Mike Pence, former Speaker Newt Gingrich and NJ Gov. Chris Christie. Donald J. Trump met in New Jersey on Monday with Senator Joni Ernst, Republican of Iowa, as he screens potential running mates in a series of meetings. One person briefed on the process, who was not authorized to speak publicly, said that the campaign began vetting Ms. Ernst in recent days as a possible vice-presidential pick. But it is not clear how seriously Ms. Ernst is being considered for a position that Mr. Trump has kept close counsel about filling. Jason Miller, a senior communications adviser for Mr. Trump, declined to comment. In a statement on Monday, Ms. Ernst confirmed that she had met with Mr. Trump. Ms. Ernst is a retired National Guard lieutenant colonel and a veteran of the Iraq war. Her military background could help Mr. Trump given his lack of foreign policy experience or national security experience. The fact that she is a woman could also help Mr. Trump with a group of voters with whom he currently polls poorly. Ms. Ernst is also considered a possible keynote speaker at the Republican National Convention, which begins on July 18 in Cleveland. 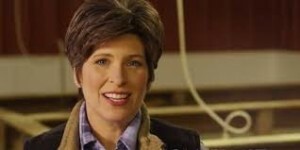 Republican Response to the SOTU: Newly Elected Iowa Senator Joni Ernst … “President Obama Will Soon have a Decision to make [Keystone XL Pipleline]: Will he sign the Bill or Block Good American Jobs? JONI ERNST … A STAR IS BORN. Tonight, Sen. Joni Ernst (R-IA) delivered the Republican response to Barack Obama’s SOTU. The freshman Senator nailed it. In a forum that is hardly a comfortable one or easy, she came across well versed, was up to the moment and never once reached for a glass of water. As Barack Obama touted questionable economic numbers and gave the appearance that we have turned the page on the economic tough times, Joni Ernst personalized the current situation that a majority of Americans feel, that Americans are hurting and are demanding answers, not the same old stale same old, same old. “The new Republican Congress also understands how difficult these past six years have been. For many of us, the sting of the economy and the frustration with Washington’s dysfunction, weren’t things we had to read about. We felt them every day.